The American Museum of Natural History (AMNH) located in New York city has created a monthly series of videos highlighting some of the 33 million specimens and artifacts held in their collection. Paleontological specimens make up 17.3% of the collection. Invertebrate fossils are a large part of the collection with approximately 4.5 million specimens. In 2014, they received the Mapes collection from Ohio University composed of more than 500,000 marine fossils. So the museum has a lot of material to pull from for creating videos. The series is called Shelf Life. The videos they have been creating so far are top notch! Episode 3 has been released for January 2015 and it is entitled Six Ways to Prepare a Coelacanth. This animal was thought to be extinct but one was caught December 22, 1938. A curator in South Africa Marjorie Courtenay-Latimer obtained it from the fisherman. She then contacted a research at Rhodes University who spent 14 years waiting for another one to be caught. Learn more by watching their video link to in the posting. If the embedded video is not showing up on your browser is the the direct YouTube link. The Coelacanth tail fossil picture at the beginning of this post was taken at Cincinnati Museum Center in August 2013. 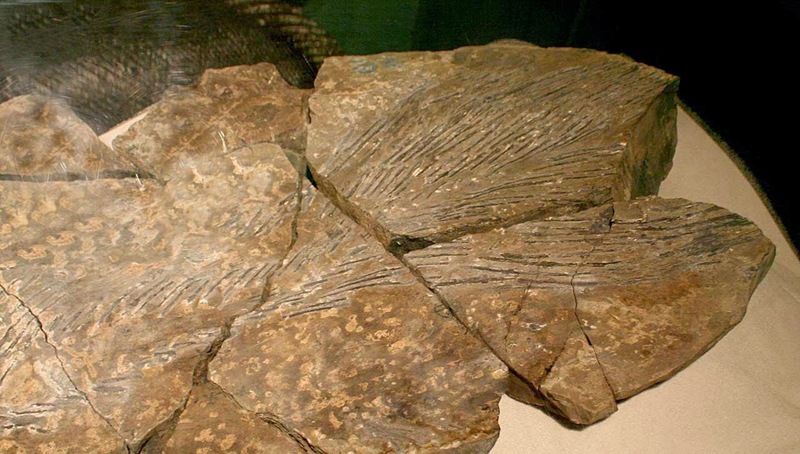 This Triassic Period fossil was found in Favret Formation of Pershing County, Nevada, USA. YouTube has another video (A Fish Lost in Time: the Coelacanth) showing a lot of clips of live Coelacanths in the deep. I wonder if the bright lights of those divers are blinding those fish. They live in a dark environment and then BAM this super bright light right in the eye. That would seem pretty painful unless they are almost blind from living in a dark environment already or have some mechanism for shielding from rapid light intensity changes. The AMNH has produced some other great videos available to watch on the Internet. Their most popular one of this writing is The Known Universe with over 13 million views on YouTube. It really puts our place in the Universe in perspective. It can be viewed at this YouTube link.